An engaging piece tracing Allied action in the Mediterranean theater. NavWarMap No. 1 The Mediterranean. 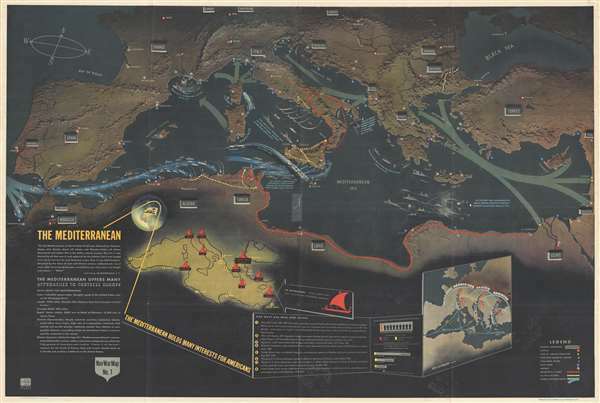 This is a 1944 Navy Department pictorial map of the Mediterranean region. The map depicts the region from the Atlantic Ocean and Portugal to the eastern Mediterranean Sea, including Syria, Lebanon, Palestine, and the Red Sea and from the English Channel, Germany and Switzerland to the North African coast. Highly detailed and visually stunning, this NavWarMap effectively summarizes Allied operations in the Mediterranean theater through the Allied invasion of Italy in September 1943. Full of information about combat actions throughout the Mediterranean, crucial details about the course of hostilities in the region are included here. Before Operation Torch, the Allied invasion of North Africa, by far the most important battles were fought the skies over Malta. Then a British colony, German and Italian forces laid siege to the island, because, as Rommel accurately stated, 'without Malta the Axis will end by losing control of North Africa.' Churchill referred to the island as an 'unsinkable aircraft carrier' which was resupplied with fighter aircraft twice by the U.S.S. Wasp, an American aircraft carrier (instead of the three times stated on the map). Operation Torch, the Allied amphibious landings in North Africa, were the first major operation in which American forces participated. The allies landed over 100,000 troops to take on Vichy French forces in Morocco and Algeria, while Field Marshal Bernard Montgomery, commander of the British 8th Army, continued to pursue Erwin Rommel and the Afrika Korps from Egypt through Libya into Tunisia, where American troops linked up with Montgomery's army. Nazi Germany reacted strongly to the Allied invasion, and invaded Unoccupied France the following day, which led to the scuttling of the French Navy at Toulon, which is noted on the map. The next Allied operation, which is also illustrated here, was Operation Husky, the Allied invasion of Sicily. At that point, the invasion fleet was the largest ever assembled, over 2,000 vessels per the map. This record would not last a year, as the Allied invasion of Normandy would bring together an even larger fleet. Following the successful campaign in Sicily, the Allies invaded southern Italy, which is also noted here. The Allied force landed at Salerno, with smaller landings in Calabria and Taranto. As stated above, numerous engagements throughout the Mediterranean theater are illustrated, including the Allied invasions of North Africa (Operation Torch) and Sicily (Operation Husky). Countries in southern Europe, the Middle East, and North Africa are labeled, along with their capitals and other large cities. Naval bases and air fields are indicated by different symbols, along with the routes of the British 8th and 1st Army (in red) and the U.S. 5th and 7th Army (in yellow). General information about the Mediterranean region is situated on the left. This information was included because the Navy education sections believed that troops that understand the greater context of why they are fighting are better soldiers. To that end, a brief history of American military involvement in the Mediterranean is also included, along with the locations of ancient sea powers, such as Phoenicia, Rome, Athens, Crete, and Carthage, and the more recent sea powers Genoa and Venice. . These maps were then distributed by the Educational Services Section of the Bureau of Naval Personnel. It is unclear exactly what the duties of the Educational Services Section entailed, but we believe that these maps were created to help educate and train naval and marine corps personnel, as the Navy believed that created more effective sailors and marines. These maps were printed in both single- and double-sided versions. We have been unable to ascertain why both versions were printed. This map was created within the Bureau of Naval Personnel, most likely by the training division, and distributed by the Educational Services Section. It is important to note that NavWarMap No. 2 The South China Sea Area is printed on the verso. Very good. Wear along original fold lines. Verso repairs at some fold intersections and to fold separations. Old recto repair. NavWarMap No. 2 The South China Sea Area on verso. Curtis, P. and J. Pedersen, War Map p. 184-87. Rumsey 8760.001. OCLC 85450222.